First, if you are not familiar with Eric Whitacre’s Virtual Choir, watch this. It’s a great talk and a moving introduction to a unique singing experience. Whitacre recently launched a Kickstarter campaign for Virtual Choir 4 and he was tweeting up a storm about it the other night. I suspect he’s getting nervous that they aren’t gaining on that final amount just a little faster. The general wisdom is that there is often a last minute surge. I certainly plan to donate and haven’t gotten around to it yet, so I’m guessing there are lots of people like me. I’ve spent the last two years studying the science of singing and all the physical and emotional benefits from a life that includes music, and I am not exaggerating when I say that given what I now know I consider singing almost as important as eating well, and as important as exercise except it’s fun. I know a lot of people think they can’t sing but a lot of people are wrong. Also, for the record, I found a study that discovered that you get many of the benefits (if not all) even if you’re not particularly good at singing (or playing an instrument). I am firmly in that category and it doesn’t take away from my pleasure one bit. The virtual choir is important because they are making it easier and easier to participate no matter where you are, and for those who want it, they are now going to offer a lot of instruction and guidance for singing better. So please consider donating and by all means, absolutely consider participating. 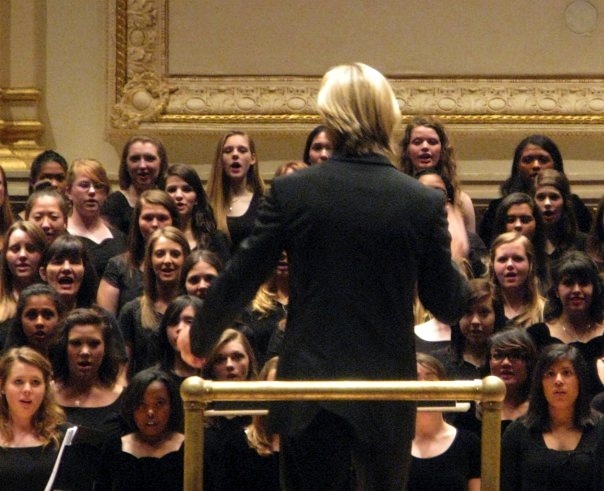 This is a picture I took of Eric Whitacre conducting his music at Lincoln Center last year.